This is a fun easy Christmas craft to do with your kids. They will love getting to make their own ornaments and it will be a fun keepsake to remember doing together each year when you hang them. These DIY photo ornaments are eco-friendly too because you can use wrapping paper and cardboard you have laying around the house. Call it upcycling or a recycle craft or just a cheap craft- it is all of the above! 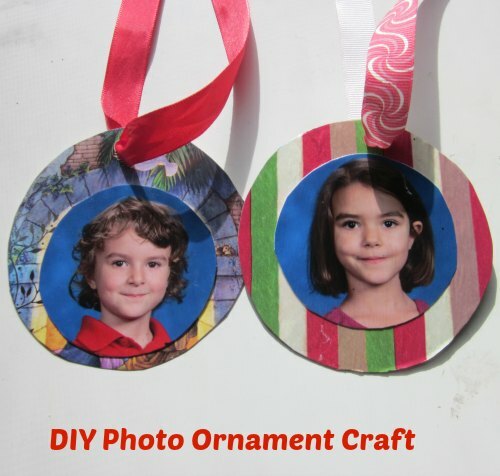 Have fun making these DIY photo ornaments with your kids. First cut out your circles. Trace a small circle onto your photo where you want it and cut it out. Trace a large circle onto a Christmas card just where you like the design and imagine your photo going well in the center of that area. Then cut it out. If you are using cereal box as your background, then trace a large circle on it as well as on the wrapping paper you will use to cover that. Cover your cardboard circle with your wrapping paper circle. If you are using Christmas cards that don’t need to be covered with wrapping paper, skip this step. Use your foam paint brush to paint a thin, even layer of mod podge over your cardboard and then place the wrapping paper on top carefully lining up the circles. Allow to dry completely-about 15 minutes. Apply a few drops of mod podge to the back of the photo and smooth evenly with the foam brush. 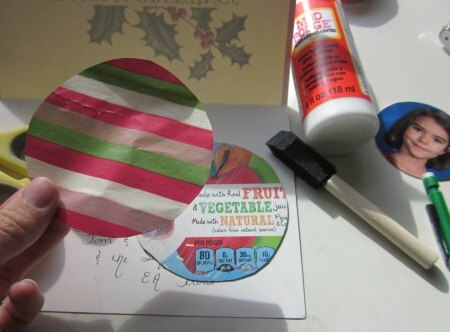 Then stick it down onto the Chirstmas card circle or wrapping paper circle you have prepared. 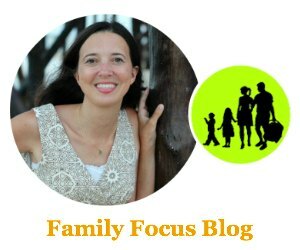 Most likely, you will want to center the photo on the larger circle but depending on the designs you may place it a little lower but not higher since you need to leave room for hanging it at the top. Seal the DIY photo ornament. 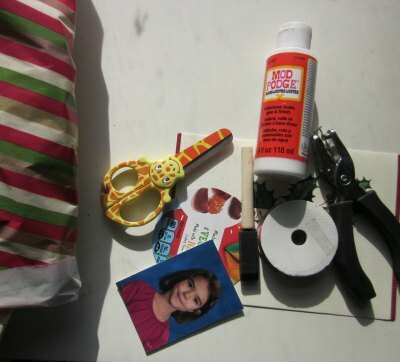 Paint a thin layer of mod podge evenly over the photo and ornament. It will appear opaque at first and you may worry about your photo but don’t! It will dry clear. Let dry around 15 minutes. You can do an extra coat for sealing the ornament more behind a glossy, protective finish. You can also embellish a little with some glitter sprinkles or felt cutouts if you like with this final layer. Add ribbon to hang photo ornament. Just hole punch at the top of the ornament and run some ribbon through the hole to hang on the tree and tie. I hope you enjoy this fun DIY photo ornament Christmas craft. What are some of your favorite Christmas traditions? 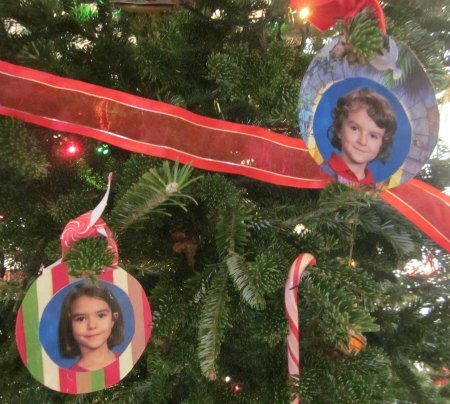 These are seriously the best photo ornaments I ve seen. I love the glamor and the specialness of the moments captured. Thanks for sharing!